The Gaming scene is dominated by very well known brands such as Razer, Steel Series, Alienware and of course our beloved Red and Green. However there’s an new brand in town, and its all very hush hush at the moment. The mysterious entry is of course a PR Stunt but it leaves us wondering what they will be about – we have absolutely no clue. 50% Probability : Gaming Laptop Company – focused on producing true slim gaming laptops, not luggables. 40% Probability: Gaming Peripheral Company – focused on creating aesthetic looking and slim (?) gaming peripherals. 0.001% Probability: New Graphics Card Vendor to create small form factor cards. So here it is, what we think this new brand AORUS is going to be for. We really do need a slim gaming laptop pioneer though. Apart from Razer we don’t really have much choice and monopolies are never healthy. A true slim form factor dedicated company (AORUS) could truly start healthy competition (Between itself and Razer) that would be mutually beneficial for both companies. The invitation itself is pretty cool too. Featuring what seems to be Egyptian hieroglyphs and a logo of an eagle attacking, the brand makes a decent first impression. Furthermore, a single badge of the logo is given in the center with an average tagline. 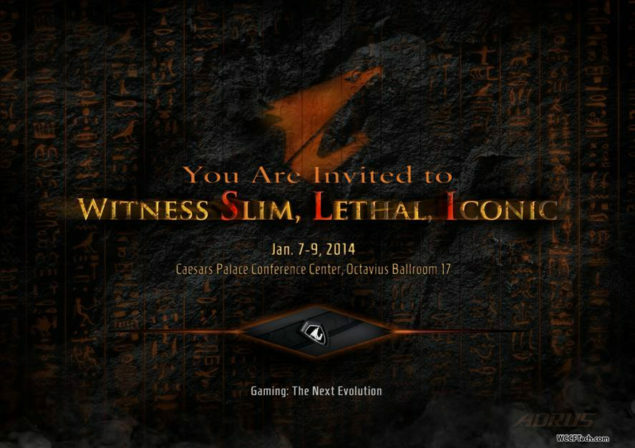 The invitation claims to present a brand that will show us “Slim, Lethal and Iconic”. This coupled with the the tagline “Gaming is the next Evolution” makes us think that AORUS is almost certainly a gaming laptop company or a gaming peripheral one.